When it comes to running your 6.0 Powerstroke diesel engine, one of the more important elements to your system is the EGR cooler. Unfortunately, it is also one of the most common points of failure. The EGR (exhaust gas recirculation) cooler, is responsible for reducing the temperature of the exhaust gases that are released from your diesel vehicle as a byproduct of the internal combustion of diesel fuel. The EGR cooler is responsible for reducing the levels of nitrogen oxides that are released from your vehicle during normal operation and thus reducing the level of smog produced. EGR coolers didn’t hit the scene until 2002. Under pressure from regulatory agencies, the top five diesel engine manufacturers began uncluding them in their production engines. Cummins, International, Volvo, Detroit Diesel and Mack include EGR coolers in all of the diesel engines they produce, which have the ability to lower exhaust emissions temperatures significantly. This lower temperature prevents nitrogen oxides from being formed and reduces the emission of harmful pollutant gases into the atmosphere. The reason that EGR coolers have the ability to be able to reduce the level of nitrogen oxides in that these compounds require a high temperature in order to trigger the chemical reaction required to form them. The EGR cooler is a simple device that simple diverts a portion of the exhausts that are formed during the regular operation of the diesel engine through a tube that includes a series of honeycombs or steel tubes that slow down the movement of the gas and encourage the transfer of heat energy from the gas to the powerstroke filter material before pumping it back through the combustion chambers. The introduction of the cooler gas then lowers the operating temperature of the engine and reduces the production of nitrogen oxides. This cycle occurs continuously during the operation of a diesel engine. 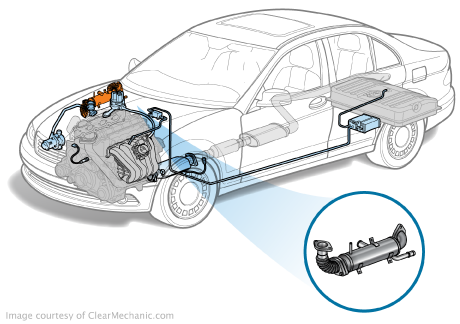 Like other emissions systems, the EGR cooler’s performance is continuously monitored through a series of sensors. For the most part, this system operates without any need for regular maintenance. However, when the cooler fails, the sensor trips an error code in the computer, which often triggers the “Check Engine” light. If the code reader detects a problem with the EGR cooler, a replacement cooler can be purchased to replace it. In most cases, an aftermarket cooler can provide additional benefits over replacing the cooler with an OEM part and can be purchased easily through various online and brick and mortar retail establishments.